Split releases are always a love-hate thing for me. 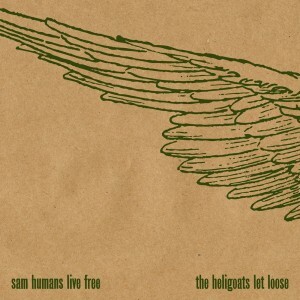 On the love side, I’m always introduced to a new artist, such as Sam Humans in this case. Humans’ music is a modern style of biting folk rock, filled with wild guitar riffs. “Hate Is The New Love” begins this process with interesting, angular chords, which is heightened with eccentricities and improvised ferocity of “Firedrill”. This song takes the cake, pulling out all the experimental folk brilliance of artists like Royal City or the master Vic Chesnutt himself. On the downside of split releases, I never know how to classify them. Does it go under “He”, “Hu” or does it get slapped with the questionable “Various” title? Given the Various title, does it again go under “HE” for Heligoats, “HU” for Humans, or “LI” for Live Free & Let Loose? One can’t really go with what they prefer because, after all, both artists are solid. 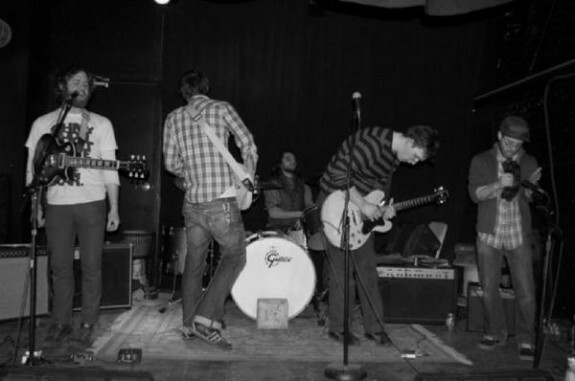 The Heligoats take the B-side on this 10″ extended play with four songs to Humans’ A-side six. This is the band of which I am familiar. The Heligoats is fronted by Chris Otepka and a year or so ago they relocated to Bellingham, which is just about 30 minutes from where I currently sit. In songs like “Turn Down The Offer”, we hear Otepka and The Heligoats foray into the same folk space as Humans. The song features feedback-oriented electric guitar abuse that just cannot be topped by a song without. Luckily, in the case of Live Free & Let Loose, the music prevails. This is the type of music that demands attention, and the split between Heligoats and Humans is ripe with this stuff. And when it’s not, you’ve got wonderfully catchy folk songs to get you through to the next freak out.